A Chart of Magnetic Curves of Equal Variation. 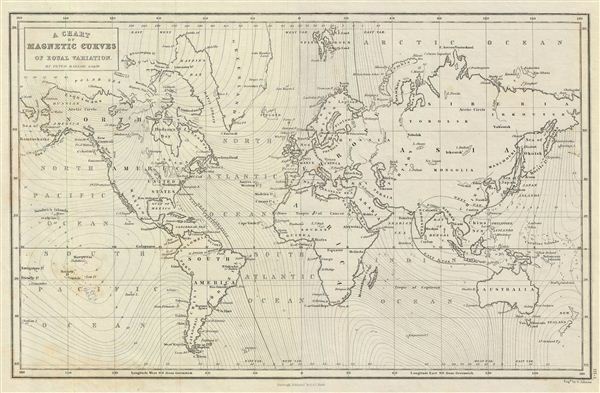 A fine example of Adam and Charles Black's 1851 chart of the World's Magnetic Curves. The chart depicts the magnetic curves over the entire world, but does not show the isomagnetic lines over any continent except North America. It marks the northern magnetic pole at the Boothia Felix (now the Boothia Peninsula) based on the first expedition by James Clark Ross in 1831. Due to the magnetic changes in the earth's core, the position of the magnetic poles change over time. In 2005, it was estimated that the northern magnetic pole was positioned to the west of ellesmere Island in Canada. Throughout, the map identifies various cities, rivers and an assortment of additional topographical details. It names various countries, but no boundaries are depicted. The map is engraved by G. Aikman and issued as plate no. III-I in the 1851 edition of Black's General Atlas. Rumsey 2305.006 (1854 edition). Philips (atlases) 4334.